Compact and lightweight, this standard zoom lens with Pentax K-mount provides DSLR users with a versatile focal-length range from 28mm wide-angle to 105mm medium telephoto. Great for everyday photography, the 28-105mm f3.5-5.6 D FA ED DC weather-resistant lens is designed to accommodate the image circle of a large 35mm full-frame image sensor, thanks to the inclusion of state-of-the-art optics and high-performance optical elements. 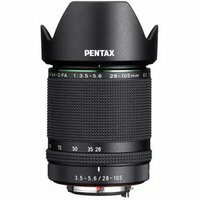 When mounted on the Pentax K-1 camera body, it delivers high-resolution imaging power, making it an ideal multi-purpose lens for the new 35mm full-frame digital SLR camera.